Making a second run up to Upstate Concert Hall, after being there just over a week ago for Amon Amarth/Sabaton. New York City might have been a bit closer, but Starkill wasn’t playing NYC, and I figured the upstate concert would be a bit more “intimate” as well. Turns out, it was a great move for both reasons. With an earlier start (6:30) and no local openers, Starkill made their way to the stage before many audience members were in attendance. However, they provided a great 30-minute set for those who caught them. Most of the cuts coming from their excellent recently release sophomore effort (Virus of the Mind); they played through “Be Dead or Die,” “Fires of Life,” “Into Destiny,” “Virus of the Mind,” and “Breaking the Madness” with energy and precision. For a young band with a few member changes over the past year or so, their sound was tight and watching Parker Jameson and Tony Keathley shred some solos was well worth showing up early. The clean vocal approach of the new album is definitely a highlight as well. Starkill has a knack for getting on some high profile tours, and rightly so based on their live set. Hopefully they’ll come through with a lengthier set list next time. Next up was Huntress, who were far more impressive than I would have guessed if you had asked me before their set. Vocalist Jill Janus has an impressive set of pipes, showcasing even from her soundcheck off-stage. The entire band was quite energetic on stage, with Janus doing a great job of engaging the crowd, as well as strutting and occasionally high-stepping around the stage. Her charisma was infectious (not to mention the vocals) and seemed to wake the ever-increasing crowd out of their slumber. Her admission that she was from Oneonta (NY) also drew quite the cheer. Their seven song set seemed to end far quicker than it should have, with some selections from both albums, including “Spell Eater,” “Destroy Your Life,” “Zenith,” “Children,” and “Eight of Swords.” They also played two new ones, which will appear on their next full-length, due early next year, entitled “Stoked” and “Black Tongue.” Based on the strength of these two tracks (particularly the visceral “Black Tongue”), it seems the band will have a real winner on their hands when their next album is released. As Kreator stormed the stage, it seemed that there was now a significant increase in the crowd compared with that of Starkill’s opening. Never having the chance to catch this veteran band in the live setting, they did not disappoint. The 4-piece commanded the stage during their performance, with vocalist/guitarist Mille Petrozza knowing exactly how to work the crowd. Their classic thrash approach drew the biggest mosh pit of the night, particularly when Petrozza asked the crowd to show him a “brutal upstate NY mosh pit” and directed a wall of death. The band thrashed through a number of classic cuts (as well as title tracks), with standouts including the opener “Violent Revolution,” “Endless Pain,” “Victory Will Come,” “Phobia,” and of course, “Pleasure to Kill.” The crowd, more than happy to participate, fist-pumped, moshed, and sung their way through the almost hour-long set. Primed from Kreator, the crowd was more than ready for Arch Enemy. 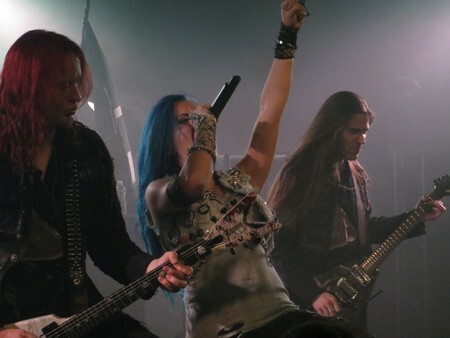 All eyes seemed to be on Alissa White-Gluz, as it’s her first tour in the States with AE, and she certainly impressed. She had plenty of energy on the stage, interacting with both the band members and the crowd throughout. She waved flags, raised mic stands, and screamed her heart out. Some of her vocals sounded even more brutal than on record (always a plus for any vocalist in my opinion). There should be no question that she has more than earned her position as Arch Enemy’s vocalist (not than anyone who had heard The Agonist’s material were questioning it). A standout perfomance! Arch Enemy blazed through a solid, balanced selection of cuts (though there a track from the Liiva era would have been nice), with some highlights being “Ravenous,” “Enemy Within” (great choice to open with this one), “As the Pages Burn,” and the closing “Nemesis.” The encore rendition of “Snowbound” was quite cool as well, watching Michael Amott and Nick Cordle play off each other as well as Amott’s interaction with the crowd. There was some jumping to be had during “No Gods, No Masters,” and a fair bit of singing during “Dead Eyes See No Future,” the crowd happy to be involved in the band’s every move. If War Eternal saw the spark return to Arch Enemy, then their current live performances are truly igniting their position. This is a band that is on top of their game right now, and from start to finish, this is definitely one of the can’t miss tours of a crowded fall season.